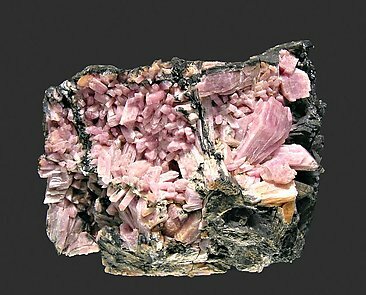 Groups of Inesite crystals with very well defined simple forms, bright and with a very intense pink color, on a matrix of the same Inesite with minor Calcite. The locality is an American classic for the species. The sample is from a J. Fabre exchange with the collection of duplicates of Joaquín Folch in the year 1987, when this collection was not well known under this name. Specimen of good color and good crystallization from this locality, classic for Inesite. The specimen is accompanied by a Lidstrom’s label. 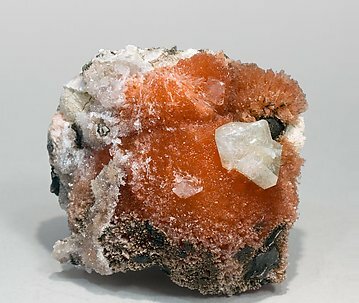 A fan of Inesite crystals with a little bit of Natrolite and Xonotlite. As you can see in the photo, the color and brilliance are great, and it really is very esthetic. 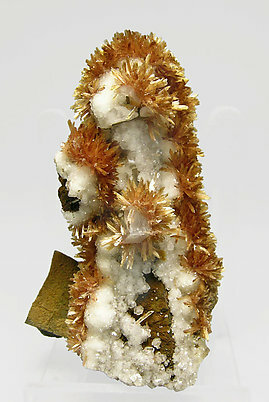 An esthetic double group of acicular crystals forming open fans, on a Quartz crystal. Globular growth of acicular crystals. 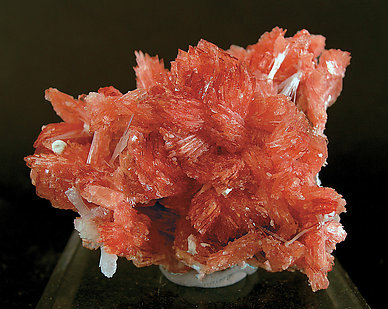 It has very deep color and small groups of very acute scalenohedral crystals of Calcite. 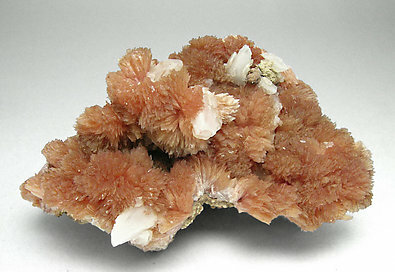 Bright orange acicular crystals of Inesite. They are on Calcite which is on matrix. 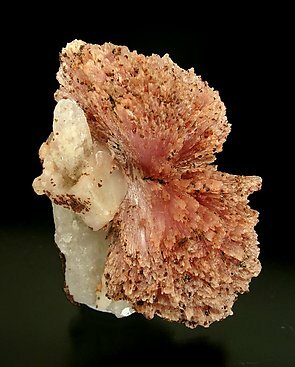 Calcite has grown in two successive generations, the first one is micro-crystalline and has a botryoidal development, the second crystallized in rhombohedrons. 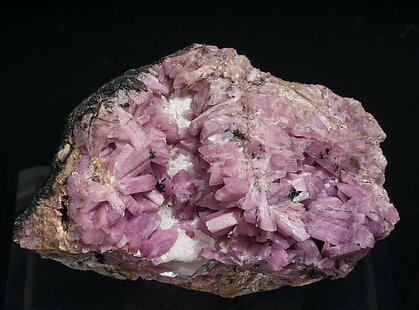 Centered growths of acicular crystals of good deep color, with white scalenohedral crystals of Calcite and on matrix. 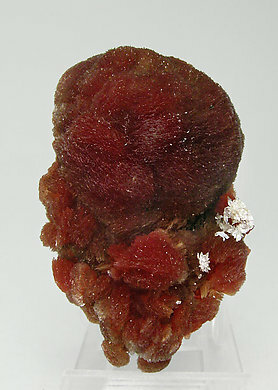 Hubeite crystals with a very good length for the species. They are very well defined and bright with a dark brown color and implanted on very fine Inesite crystals that are between translucent and transparent, bright and with an intense pink color. The Chinese Hubeites that even during their best times were scarce are currently very difficult to find. 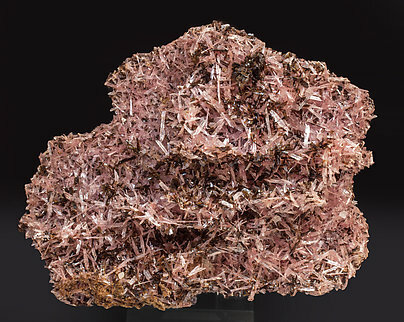 Spheroidal aggregate of acicular crystals of Inesite of good color, with a very aerial group of tabular crystals of Baryte and partially coated by small crystals of Calcite. The crystals are on a base of Prehnite. A radial group of Inesite crystals. 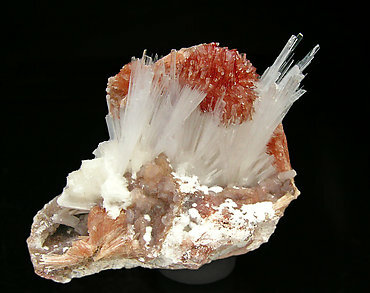 They have an intense orange-red color on a group of white crystals of Natrolite with good terminations and on matrix. 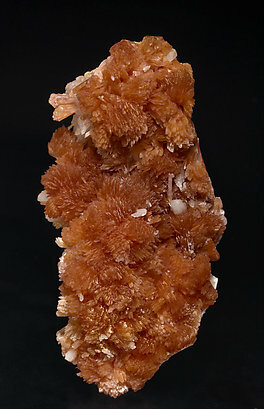 Radial growths of acicular crystals of Inesite with a very deep color, with white scalenohedral crystals of Calcite and on a botryoidal growth of Orlymanite, a rare silicate of calcium and manganese. From the type locality for Orlymanite.